Armenia's 1919 - 21 Dashnak overprints are all made with single handstamps, the Z handstamps made of rubber and the rouble handstamps made of metal. Tens of thousands of stamps were overprinted, probably most of them sold to people emigrating. There was no point taking out Armenian currency - Armenia was in ruins, was not exporting anything and had no tourist trade - but stamps were a saleable commodity abroad. Domestic postal services were very restricted and outside Armenia some mail went to Georgia but beyond that almost nothing. There are several types of ink used and these affect the look of the overprints. This is particularly the case for the metal rouble handstamps. Look at the top two block of six. Both have genuine overprints from the same handstamp, but one is made using a "dry" ink and the other with a "watery" (diluted) ink. The effect of the diluted ink is to eliminate the fine detail of the Monogram above the "10r" and to make the "0" in the "10r" appear more round. 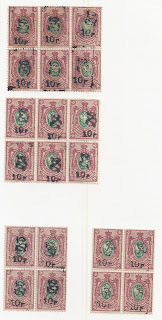 But if you put these overprints on top of each other, they match very well - the overall dimensions remain the same. At the end of the Dashnak period, rouble surcharges were added to stocks of stamps with existing Z overprints. The bottom left block of 4 shows "10" added in black over a small Z in grey ink so the overall effect is not too bad. But on the right, I show a block of 4 where the Monogram above the "10r" has been obscured (Dr Ceresa suggests with a paper strip) so that the Z can still be seen. Importantly, the Monogram has not been removed from the 10r handstamp to create a new type: if you look at the stamp in position 1 in this block of 4, you can see traces of the Monogram below the Z. 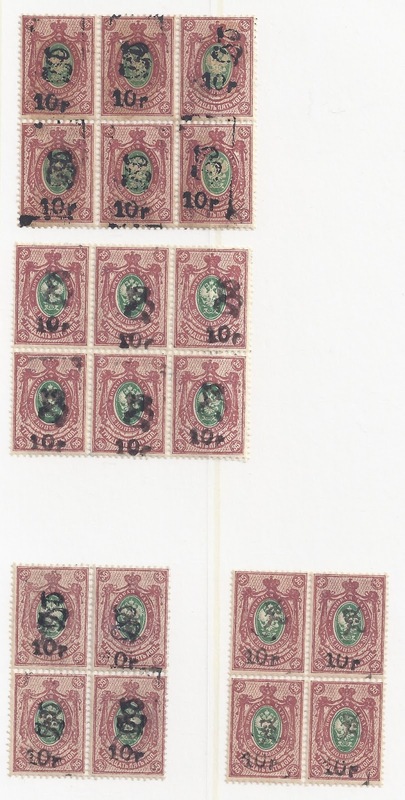 This effect is common on these stamps - though the stamps themselves are scarce or rare.